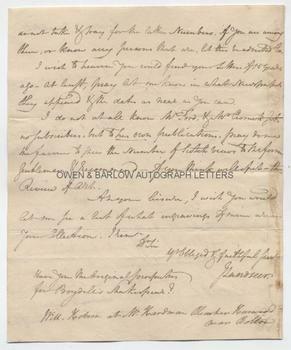 JOHN LANDSEER autograph letter Signed. British (English) artist and engraver. Father of Edwin Landseer. ALS. 2pp. London. 1st March 1808. To William Hobson at Mr Hardman Blacker Harwood near Bolton. "I received and read with great pleasure your letter of 26th February. Your sentiments perfectly coincide with my own indignant feelings. Respecting the patronage, as it has been called, of our Art. What I want is that such persons as Boydell, should become Agents not Directors of works of art. They might thus become useful men. There is a Review of the Arts coming out, the 1st No. will appear in a day or two, and which I have great hopes will do good. I hope you will get it, and further that you will be at the trouble of addressing such a letter to the Editor as might be printed with effect, recommending a review of Boydell's Shakespeare, with such information on the subject as you may think proper and be able from your knowledge of past transactions to impart. Some subscribers have lately been threatened with prosecution if they do not take and pay for the later numbers. If you are among them, or know any persons that are, let this be addressed to [sic]. I wish to heaven you could find your letters of 15 years ago. At least pray let me know in what newspaper they appeared and the dates as near as you can. I do not at all know Mr Ford, and Mr [Cromek?] gets no subscribers, but to his own publication. Pray do me the favour to shew the Number of Scotch Views to the former gentleman, and recommend - if you think well of it - the Review of Arts. At your leisure, I wish you would let me see a list of what engravings of mine you have in your collection. I remain dear Sir, your obliged and faithful serv[an]t, J. Landseer. Have you the original prospectus for Boydell's Shakespeare?" 4to. Approx 8.5 x 7 inches. Slight mounting traces to right edge of last page, else near fine. 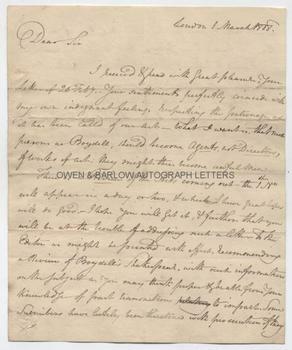 An exceptionally good John Landseer autograph letter. The acrimonious dispute between John Landseer and John Boydell and his son, Josiah, was one of the defining incidents in Landseer's life. John Landseer was a staunch advocate of engraving as an art form in its own right. In 1806 he had delivered a series of lectures to the Royal Academy in which he defended engraving as a separate art form and criticised the habit of publishers who were led, for commercial gain, to issue inferior and cheaper plates. This series of lectures was halted following the threat of legal action by Josiah Boydell, who claimed that John Landseer had slandered his father, John Boydell, the leading publisher of engravings who had died two years previously, and had harmed the business now under the control of Josiah. John Landseer continued to campaign against the practice of publishing inferior plates and for the rights of engravers. In 1807 John Landseer published the lectures in full, with added criticism of Boydell. John Landseer also campaigned for engravers to be admitted as full members of the Royal Academy (although this did not happen until after his death). The R.A. did grant John Landseer associate membership and he was later appointed as engraver to King George. Landseer's children, Thomas, Edwin, Charles and Jessica, all went on to themselves have successful careers in art. Provenance: From the 19th century album of Emma Marshall of Penwortham Lodge, Preston. Emma was the daughter of William Marshall, land owner and cotton manufacturer, and was related by marriage to the Miller family of baronets, M.P.s and landowners.